What Are Net Zero Homes (and How Do They Protect the Environment)? While we all hear a lot about carpooling, using metal containers instead of plastic water bottles, and recycling as a way to chip away at global warming, many environmentalists recommend a more aggressive approach to help protect the environment. Those looking to cut their carbon footprint and boost sustainability may be interested in a Net Zero Home, otherwise known as a Zero Energy Home. Now, the first thing to clarify is that these homes use energy, so the label might seem a bit misleading. However, they aim to use only renewable and clean energy. However, the key design and strategic-placement element of these homes is photovaltaic solar panels. The solar panels are strategically placed to take in the most sun, and they generate the power needed for the home. To be best optimized, the Net Zero Home will also have a solar-powered water heater. Therefore, the home is built to use as little energy as possible, with solar-generated energy serving the modest needs. Appliances, such as refrigerators, would be as energy-efficient as possible, too. By eliminating the use of energy derived from fossil fuels, Net Zero homes avoid the associated greenhouse gas emissions associated with electricity production. According to the U.S. Environmental Protection Agency, electrical power generation created 28.4 percent of U.S. greenhouse gas emissions in 2016. Net Zero also helps avoid the negative environmental issues associated with other energy options such as hydroelectric power, and its impact on aquatic ecosystems. When people think of going "green" and trying to live energy-efficient in general, they may think of (among other things) installing solar panels. However, the Net Zero Home takes a broader approach, saving energy from all angles. That is one of the benefits to using this approach––if one is going to go through the effort and expense of putting in solar panels, one should derive the maximum value possible. The second big, obvious pro is the savings on electric bills. One pays for the installation of panels just once, while requiring less power indefinitely and while not paying electric bills or being subject to rising and falling costs of electricity. 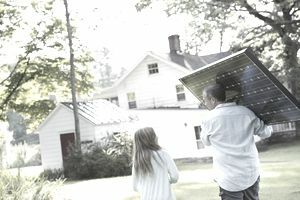 Another pro is that the newest photovoltaic solar panels are durable, long-lasting, and able to stand up to the elements. Their lifespans are usually about 30 years. People may suspect that there's something fiddly or high-maintenance about solar panels, but that is not the case. Solar panels are one of the sturdiest components a family could ever install in their home. As for cons, one of the biggest is the sporadic or slightly unpredictable nature of solar power. On dark, cloudy days, while the solar panels may be able to generate some power, it may not be able to generate all that is needed. Also, even if it's sunny, a gathering or a spike in the use of computers and charging other devices can outstrip the power supply. This doesn't mean that everyone will sit in the dark. Net Zero homes are actually connected to the electrical grid for circumstances like these, and that's the con. One is still connected to the system that these homes are trying to make obsolete. Now, to be clear, there will also be times when the Net Zero Home will produce more energy than it needs––remember, the homes are built to require less power than an average home. When this happens, the family "sells" its excessive energy back into the energy grid––meaning that some percent of the energy in the community comes from that family's "clean" energy. That is where the "net" in "net zero" comes from––it contributes to the grid as much as it uses. It's just important for people to realize that these houses are not fully self-sufficient in the sense that they allow people to live "off the grid." For a home to be certified Net Zero, it will have to meet certain qualifications. These are spelled out here, and come from the U.S. Department of Energy (unless you are building in a different country, of course). In short, there is a lot of overlap between these Net Zero Homes requirements and those for Energy Star certification. The homes must have Energy Star appliances and must have high-performance windows that meet certain standards. Keep in mind that it is now possible to find homes that are Net Zero ready, sometimes requiring just the purchase and installation of the solar panels. One doesn't necessarily go toward the Net Zero option as a way of saving money. However, as discussed, there are absolutely crucial environmental needs that can be approached in this way. And, of course, the idea is to save money in the long run. An architectural site that focuses on helping people get the proper permits, 24plans.com, estimates, for one reference point, the cost of building a net-zero home at about $23,000 dollars more than a standard home. As you can see, this is a minor difference and can be made up by the savings in electric bills. One factor to recognize is that one can also choose modular homes that are built to be net zero ready and that have a buyer's budget in mind. As we move forward, builders will understand how to make these homes more affordable. Those looking to retrofit will face lesser expenses––the panels themselves run about $21,000. Since the family would be retrofitting a house rather than building one to specs, being sure to get the most energy efficiency will be the biggest challenge. The net-zero home is the cream of the crop of energy-saving solutions. It's for people who don't want to do things halfway.